The day the removalists came was probably the most significant of this two week moving period. I certainly slept better in the new house with that hurdle out of the way. Yet, there is still so much more to do. Other life matters have started to intrude on the moving process. It was time for my six-monthly visit to the dermatologist. I often have liquid nitrogen blasted around the hairline of my face during these visits but today it was only at my thigh, at length, to remove a superficial basal cell carcinoma (BCC). Liquid nitrogen hurts but the intensity of the pain lasts a short time. I had some mild pain for another half hour and a blister formed, which popped the next day and then it stuck to my jeans. A bandaid remedied that. I have had four BCCs removed from my face during three separate day surgeries, generally making me look like a victim of a major car accident each time. As a result, my face is a little wonky with my lips and eyebrows no longer completely even. I have been blessed with a talented surgeon for these operations, even if the first thing he ever said to me was, “What big pores you have! You’re going to scar.” He really isn’t the big bad wolf but a gentle tailor of skin. It was also time for my six-weekly visit to my hair stylist. I have dyed my hair for 16 years now; the last two years blonde and before that, various shades of red. I was a natural redhead but Emma stole the redness from me. A few times people asked when she was little where her red hair had come from. This shocked me so as soon as I earned an income again I began colouring it. Some friends are encouraging me to go back to red but for now I’m enjoying the blonde. I think if I change it will be to test what my natural colour is after all this time. As for moving house, I only lasted a few hours on Tuesday since the weather was so muggy and spent a lot of time unpacking on Wednesday. It has been a challenge but I’m quite happy with the furniture arrangement, although it is more crowded than I would like. On Thursday, Emma, Griffin and I did one last major effort to clear everything out of the house before the cleaners came to finish it off. That’s not to say we have finished, not by a long shot. The storage areas under the house is the equivalent of a large tool shed which is also home to a couple hundred bottles of wine. That area has hardly been touched. This is Saturday’s job. Now I have all my clothes moved I assembled clothing racks bought from Bunnings as a temporary measure until I go to Ikea. I tried to cull clothes as I put them up but there are many pieces that are currently a size or two too small that I still love. I really must work harder at losing weight. Tonight I was with a large group of friends. Some played cards while others of us worked on a jigsaw. 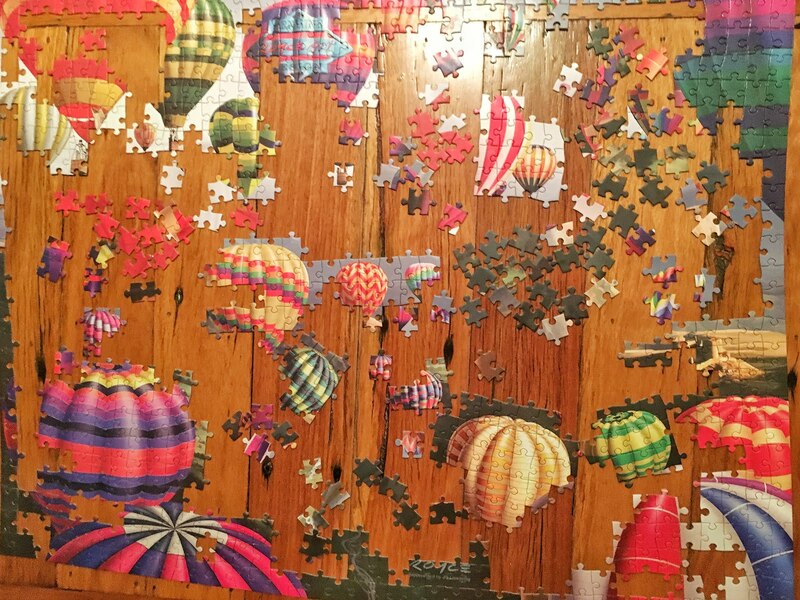 My life is feeling like a jigsaw at the moment. The jigsaw we were completing tonight is a picture of hot air balloons. Life is a little up in the air at the moment but the pieces are being slowly put in place.